Ever have to get up at 4 am? Get in the car, park, get on a bus, ride, get on a plane, get on another plane, get a rental car, drive through a strange city, find your hotel, park. Yeah, am contemplating that adventure. Will let you know how it turns out. After a week (weeks? months?) of rain and chilly weather (cold. Like frosty) we are now supposed to have summer weather: hot & humid. Me? I like cool and sunny. 60F and sunny, occ breeze, is my fav weather. Hot & humid, no thanks. Hot and dry, perhaps. If by hot you mean 75F. and basil. Didn't mean to omit mention of basil. Also didn't mean to leave off the fact that the kale, chopped, topped a frozen pizza. I did not serve myself a bowl of kale, spinach, and lettuce. Leaves were incorporated into delicious dishes. Pizza fixed up with kale, basil, and dried hot peppers. Most of the spinach and lettuce went into tomorrow's salad. Hors d'oeurves were steamed artichokes. Eating kale, lettuce, and spinach from the garden. Kind of amazing considering our spring weather: frost, snow, rain, and wind. Garden is resilient. OK, peppers are not doing so well. Peas are fine, 6 inches tall and climbing. It's so satisfying to dig, plant, weed, and harvest. It's so good to be able to eat local, organic, raw. It's super de duper fab to find a harmless substance that deters slugs. Coffee. So far I've scattered coffee grounds near seedlings. As garden grows I will try brewing, cooling, and spraying coffee. I putter. Pull weeds and dump them on the compost pile, admire colors, celebrate sprouts, and watch birds. I cheer for bees, knock down wasps' nests, become entranced by ant colonies, and am amazed by cardinals. We had a good start, but currently dealing with cold and rain. Temps in 40s and 50s, wind, drizzle, and pounding rain for a week. So... didn't have to water the garden, but some sun and heat would be good. It's still wool sweater and sock weather. I've turned on the heat every day, just a bit, just enough to take down the chill and damp. We get used to it. I garden in the chill drizzle. Today I bought 4 blueberry bushes, 100 pound of small stone, and 3 bales of hay: I made a blueberry garden. Gave the plants some Reiki. 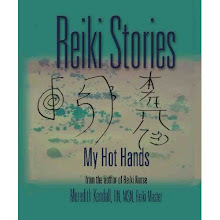 Yes, this book helps me understand Reiki. Flipping to right brain: this is why I experience bliss, why I can't feel my hands or my body, why I lose track of time, and why I can't speak. 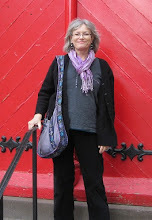 My Stroke of Insight, by Jill Bolte Taylor, PhD. Reading such a good book: My Stroke of Insight, by Jill Bolte Taylor, PhD. Her stroke leads her to perceive life from her peace & love right brain, rather than her analytical & judgmental left brain. "My right mind character is adventurous, celebrative of abundance, and socially adept. It is sensitive to nonverbal communication, empathic, and accurately decodes emotion. My right brain is open to the eternal flow whereby I exist at one with the universe." Jill Bolte Taylor. "My right mind... is the seat of my divine mind, the knower, the wise woman, and the observer. It is my intuition and higher consciousness. My right mind is ever present and gets lost in time." Reading this book (My Stroke of Insight), I realize that when I share Reiki I flip from my linear organized logical left brain to my cosmic oneness loving right brain. Cool! Spoke about Reiki this evening: history, ethics, principles, and practice. Many interesting students. No one asked to be attuned, so there were no attunements. I invited them all to try a Reiki session, and to come back for more instruction. It seems they might; that's good. It was another 12 hour work day. I came home, changed into garden shoes, and wandered in the beautiful silence. Echoes of quiet. Slowly I became aware of birdsong, green, and damp. I could see my breath. The ground squished in low places. The beans are up. I sat in the summerhouse and had a nice conversation with myself. Now laundry, dishes, emails, a little work, and to bed. Up early again, for another day of teaching; then a party. Oh, what to wear. Do I have any small talk. Plenty of conversation in the garden; plenty of Reiki talk. Would rather be in the garden. Came home from a long day at work. It was cool and drizzy outside. I took off my work shoes. Took off my socks, and rolled up my work slacks. I went out into the green wet. The beans are sprouting. Peas are several inches tall. Spinach is up, and maybe carrots. I planted zucchini and cukes in an iffy garden spot. It's the pallet garden I made last year. The dirt is too shallow, and dries out or floods. But I covered the dirt with 6 inches of bark mulch. Planted in the bark mulch. $3 of seeds, we'll see what happens. It's a good time to process old stuff: moldy memories from the basement and cobwebby remnants in the attic. You know, that stuff that weighs you down. Holds you back. Makes you feel resentful or guilty. Bring them out to the light of day. Look, listen, and feel. Then let go. spent so many peaceful hours in my garden the past few days - with birdsong, sun, burgeoning plants, seeds, and dirt. Also some quality time with my compost pile: turning it over, adding to it, stomping it down; and marveling at how weeds, sticks, and worms become dirt. Thank you, Reiki practitioners, my healing community. Lovely Reiki share tonight. After a busy day at work I melted into a puddle of gratitude and joy. Trying to recycle, like a good citizen of Earth. Bought this house a few years ago. Noticed blue plastic recycling tubs on neighbors' curbs weekly. I don't have a blue plastic recycling tub. So I bought a plastic recycling tub: filled it, placed it on curb weekly. The garbage guys empty and toss recycling tubs. After a few weeks of this my recycling tub was chipped. Then cracked. Then gone. The garbage guys tossed it. OK. I started bringing home cardboard boxes from work. I filled the cardboard boxes with cardboard, paper, and clean glass jars. I recycled. yay, me. This morning I placed my full cardboard box at the curb. All the neighbors had the blue plastic tubs, of course. Came home from work. All blue plastic tubs are empty, my cardboard box is full and still at my curb. What's up, garbage guys? in the backyard. Lavender lilacs- cold but fragrant. Creeping phlox is pink. The crab-apple tree is loaded with hot pink blossoms. Still have neon yellow forsythia and daffodils. Blue and yellow pansies. Curly green kale in the garden. Pale pink and so fragrant cherry blossoms. All set against jewel-green grass and bright blue skies. So it's cold. We might get a frost tonight. Stopped at a local Chinese restaurant, with three friends. You know how sometimes the menu is divided into sections such as: chicken, seafood, vegetarian, etc? Yeah, this one was. I saw a "Vegetables" section, and ordered the spicy bean curd. We sipped delicious tea and chatted as we waited for our order. I was hungry. The food came. Mine was a platter of tofu, sprinkled with red pepper flakes, in a brown sauce. A plate of tofu. Just tofu. How strange. "Excuse me, could I get some vegetables with this? Some steamed broccoli? Maybe some rice too?" I asked the waitress. She brought those things. It was a good meal. My research is toast. Eight years, hundreds of Reiki sessions, thousands of bits of data. Useless. Am actually relieved. OK, can give that up, along with so many other things. Kind of wish I could start over, as a younger person. I love research. Would do it right this time: with a theoretical foundation and a standardized tool. Evidently publishers and researchers don't like one to invent a research tool. One must use a standardized tool, and I'm not really sure what that is. Why do I blunder along, following my whims and intuition, instead of doing things the "right" way? Eight years of research useless. Well, good enough for a magazine perhaps; not a journal. Good enough for an article on what not to do. It really is here. Spring. Jewel-like colors in the garden, no jacket needed, and I linger outside until dark drives me in. I transplant, move dirt, mow, pull weeds, plant seeds, and water. I admire, observe, and dream about what could be. Daffodils are going by but lilacs and apple blossoms are coming. Picking kale and chives, planting spinach, peas are up but need rain. Watching for bird and hornet nests: former are welcome, latter not so much. Rain tomorrow? A good time to plant green beans, beets, carrots, and zinnias. Planning summer activities. Kayak or bicycle? Asphalt and mountains or rivers and ponds? I enjoy both. So many factors, such a decision, and really- all I do is work. Which is more likely to occur? and in back of everything, I keep thinking about the stories Aunt Lois told me about her European travels. Five months in 1952: 2 college girls from North Dakota, so many stories. Someday I'll share. Right now I'm holding those stories close to my heart. For her travelling companion was my mom, who died when I was 7. Some day I'll tell you about the Georgic, the wine festival in Dusseldorf, the Windsor palace guard, the figs, corn, and the lingerie department at NYC' Macy's. Couldn't seem to get myself out of the garden this weekend. Temps in 60s, breezes, and total sunshine. Kept thinking, "I should, I should, I should: work on scholarly article, buy shoes for work, buy lovely bark mulch (nice dry pine @ $2.69/3cu ft), go grocery shopping, go to psychic fair, visit friends and family, something?..." Instead I pulled dandelions with my lovely dandelion digger tool. Of course felt guilty for tossing them on compost heap instead of steaming and munching. Weeded, read, weeded, read, reflected. Am working on Crombie's Kincaid & James series. So good. Too cool to plant, Maine's spring weather is too unpredictable. So I weeded, raked dirt, planted a few spinach seeds, and turned the compost heap. I read. I soaked up Vitamin D.
It was one of those perfect days: sun, 60 degrees, and breezy. I jumped out of bed, eager for coffee on the deck. Had it out there with a good book. Am working through Deborah Crombie murder mystery series: Kincaid & James. My sister's recommendation: a good one. I got down on the damp grass with my special dandelion tool and plastic sled and pulled dandelions from the lawn. I filled the sled. The dandelions hide this time of year, their jagged leaves blend with the grass. Only if I brush the grass aside to find the red stems and buttons of unopened flowers do I find them. I should eat these, I kept thinking. In salads or steamed. Dandelion greens are full of vitamins and minerals: a spring tonic. I read more. I watched wasps, to see where they're building their nests this year. The breeze rattled the morning glory vines, blowing seeds in to the summer house. I picked up the hard black seeds and dropped them on fresh dirt. I read more. Should I bring out my phone? Or will the EMF be harmful? What if someone calls? Who will call? I turn over the compost pile, layering with dirt and dandelions. I spend the day in the garden: weeding and reading. I check the phone. Karen. OH, we have dinner plans. I call, we confirm, I rush to pick up my gardening tools, jump in to the shower and clean clothes. We meet at the Japanese restaurant. Local beer on tap, wasabi scallops and vegie pad thai. I end the day on the deck, reading that good book. It's sunny and breezy. can you open & view? Bright yellow and green after months of white and gray. Mow the lawn, move dirt, plant stuff. and Reiki class is fun. Make movies and slide shows. Read about Reiki. Try it. Share Reiki with others. Reiki is amazing. Love, community, and connection. Find a great teacher and try it today. Is my higher self, an infinite field of energy. My soul strives to learn, grow, expand with light, and ultimately reunite with the energy of the original source.